This picture of Crispin Benjamin was taken right after his portrait session for the Bahamian Project. The final portrait images will be unveiled at the Exhibition Opening at the National Art Gallery of The Bahamas on July 11, 2013. J. W. Crispin Benjamin was born August 25, 1920. He is now retired after a lifelong career as a civil servant of The Bahamas Government. 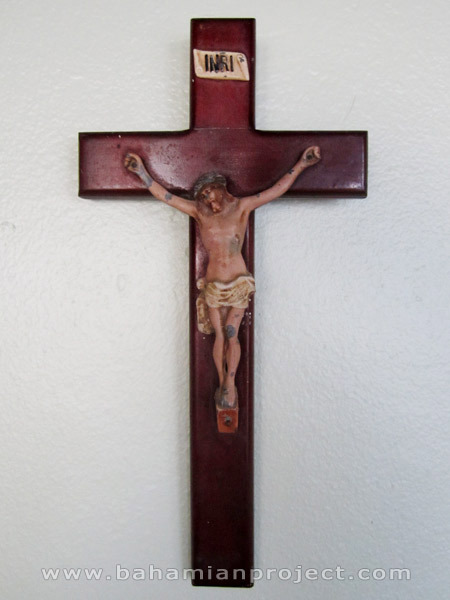 He also held key positions representing the Catholic Church, not just in The Bahamas, but throughout the Caribbean. 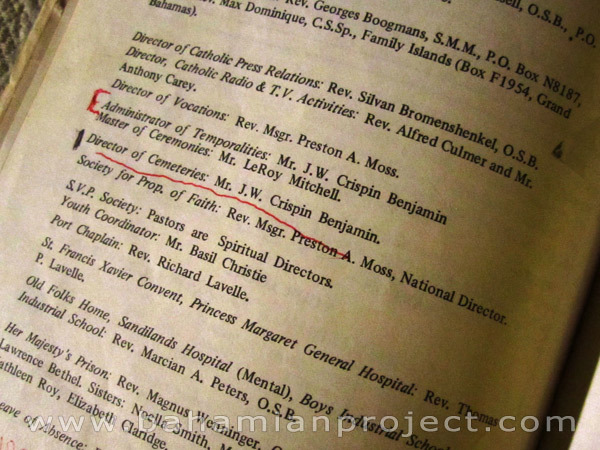 He told me he wanted to show me something and then pulled out a book – “Caribbean Catholic Directory 1980” – in which is name is listed. 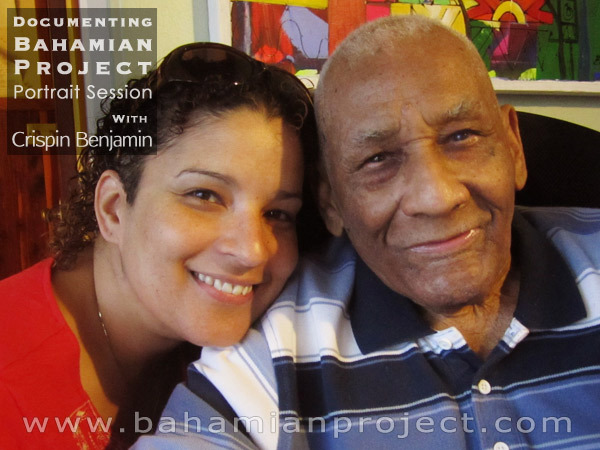 Because Mr. Benjamin was limited in his mobility we opted to photograph him at his home. The Catholic presence is obvious. Upon entering, the first thing I noticed was a statue of the Virgin Mary holding baby Christ. It stood on a small elevated platform in the corner of a rough-hewn stone wall. 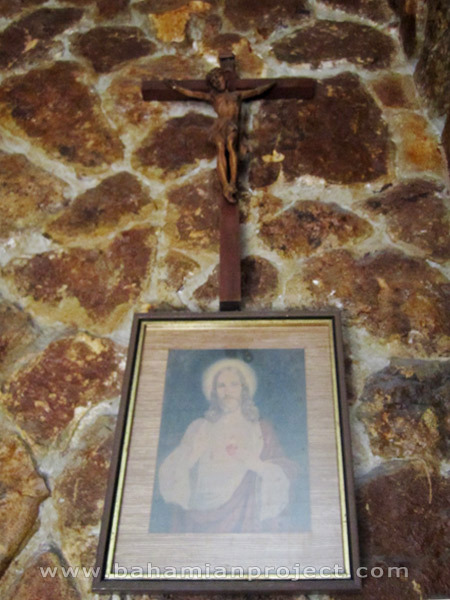 Above it was a depiction of Jesus and a wooden crucifix. While we set up lights and equipment Mr. Benjamin recounted some of his experiences. He told us about his years working for the government, and the various things he did. He talked also about his travels around the Caribbean for the Catholic Church, and when he met Princess Margaret. It was when she came to Nassau for the renaming of the Bahamas General Hospital to The Princess Margaret Hospital. He has had many interesting experiences, he has seen much of the country’s history in the making… first-hand. He has been quietly present – witnessing, sometimes influencing – many of the nation’s defining events and occurrences, “like Forrest Gump,” said Dionne. Indeed. Dionne told us a story that, I think, reveals a little something about the virtues of Mr. Benjamin’s character. She said he had once received a special gift, a bottle of Chivas Regal. It had been given to him by Queen Elizabeth II when she came here on her honeymoon. Mr. Benjamin had been responsible for paying the staff on the Queen’s ship and she wanted to thank him for his service. He treasured this gift and kept it for many decades… until a new housekeeper took it upon herself to drink it and throw away the bottle. Many would have been outraged over the loss of such a prized possession and the blatant disregard shown, but Mr. Benjamin’s reaction? “He just laughed,” said Dionne. Top Photo: Dionne Benjamin-Smith with her father Crispin Benjamin. Documentary photos by Lisa Wells.